The largest problem folks have when they first go gluten-free, whether to treat celiac or non-celiac gluten sensitivity, is replacing all the ordinary gluteny foods with store-bought gluten-free junk food. There's three problems with this. First off, junk food remains junk food even when it's gluten-free. Second, the stuff is massively overpriced. And finally, if I'm going to eat budget-busting junk food, it should at least TASTE good and most gluten-free stuff doesn't even come close to qualifying. You pretty much have to do some cooking to survive a gluten-free diet with your health, wallet and taste buds intact. This is where a bunch of real food bloggers come in; many of us have done gluten-free trials, or regularly do gluten-free diets like paleo or GAPS. You get 30 of us together and collect our best gluten-free recipes for a cookbook and you wind up with the best of gluten-free recipes. My personal contribution was my awesome Pão de Qeijo (Brazilian cheese rolls) which are just flatout yummier than any gluten-free bread you can buy anywhere and only take minutes to whip up. So our third e-cookbook is Gluten Free Snacks, a yummy compilation of our favorite real food, budget-friendly, gluten-free recipes without you having to go buy 10 different kinds of flour you never heard of before! 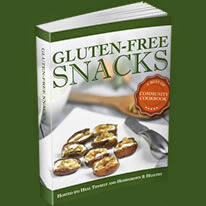 You can read more about it on the Gluten-Free Snacks e-cookbook page or just go ahead and buy it now. Tracy of Oh, The Things We'll Make!